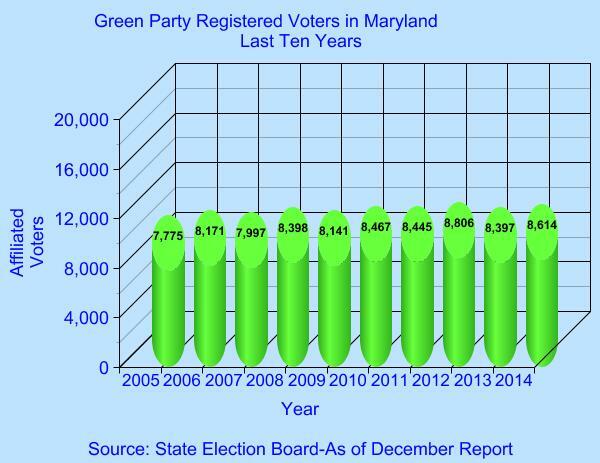 While consistent with the national trend of rising libertarian registrations, the rate of growth in Maryland is nothing less than astounding. 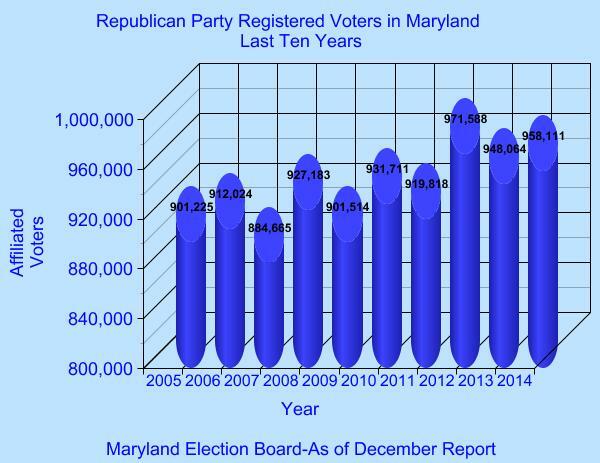 Over the past two years, the Libertarian Party of Maryland is the only party that showed a net increase in their registrations. Our registrations grew by 29.95%, whereas all the other party registrations decreased! 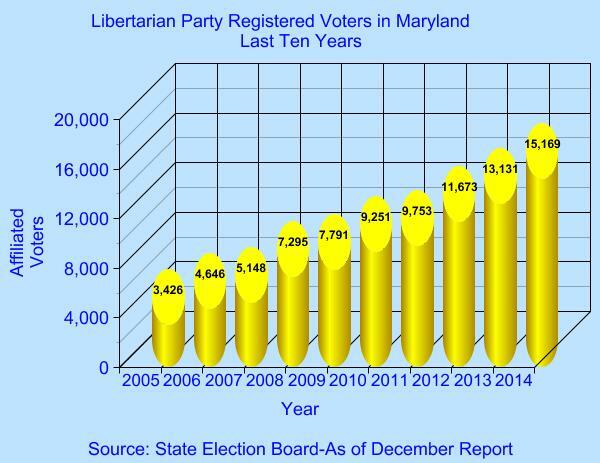 As of the end of 2014, we reached 15,169 registered libertarians, a historic high for the party here in Maryland. Our growth rate in registrations eclipsed even the movement of voters to unaffiliated status, which is important considering the widely-reported disenchantment with political parties over recent years. While I normally measure registration statistics over two-year increments to average out short-term variation and make them comparable with statewide electoral results, the charts below show that our growth has been consistent over ten year period, averaging 19.4% a year. According to the latest issue of LP News, national LP registrations are up 8.3% over the past seven months. According to ballot access expert Richard Winger, the national data show there were 368,561 registered Libertarians in March 2014, compared to 330,811 in November 2012, a national growth rate of 11.4%. We are nearly tripling the national average in Maryland! While our growth is impressive, we must remember just how far behind the main parties we are in total registrations. Notwithstanding our growth rates, our 15,169 registrants is only 0.41% of the total registered voters in the state. 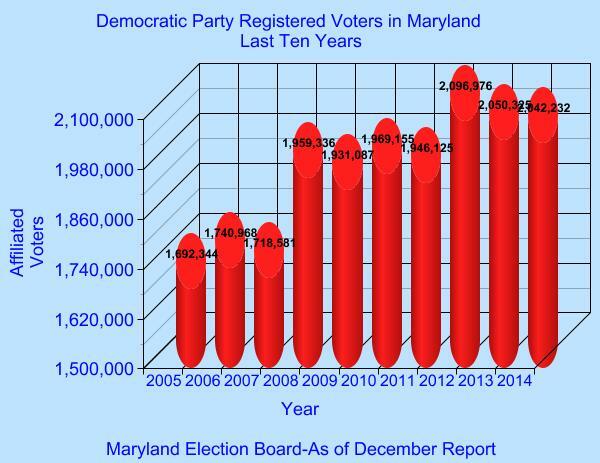 The Democratic dominance in Maryland remains staggering in comparison and while Republicans have made modest gains, even their numbers dwarf our 15,169. Recognizing this disparity should not discourage us, but instead provide motivation for expanding our efforts to provide an alternative voice in support of liberty. Author: Eric Blitz. This entry was posted in Voter Registration.